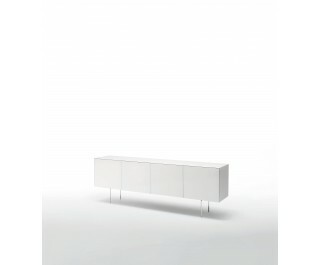 Series of storage furniture in tempered glass, glossy or opaque lacquered, glued 45°. The interior is in laminated opaque charcoal coloured wood and shelves in 10 mm. thick transparent extralight glass. The bottom of the drawers is in glass in the same finish of the outside, while the compartments with doors are covered with mirror ( no sides). The codes MGB02-04-08-13 are supported by a base with thin legs in glossy chromed metal or by two slabs of tempered extralight glass. Push-pull opening system for the doors and the drawers. On demand, the models with doors ( except for MGB05 and MGB06) are provided with cable outlets in the bases, that can be available in the right or left compartment or in both of them. The model MGB14, the same of MGB12, is hung on the wall.